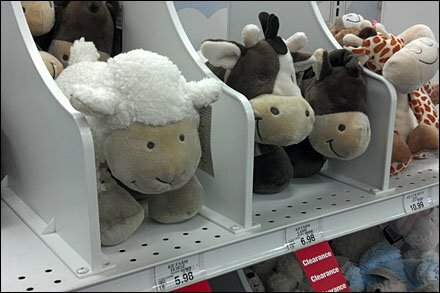 These plush toys look ready to bolt from the starting gate created by solid plastic Plush Toy Shelf Dividers. Being fair they did help to contain the most unruly of the toys, though I am almost positive none were plush race horses. 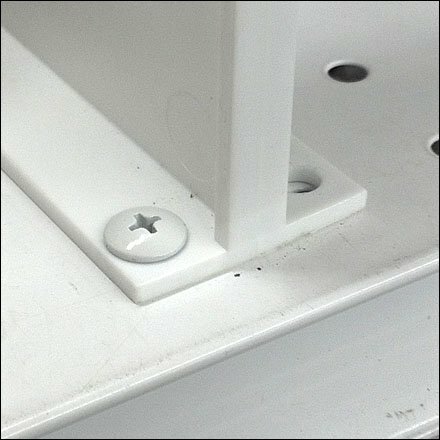 Dividers mounted with Truss-style Phillips Head threaded fasteners, but unseen below were customer-safe Rounded Cap Nuts. CLICK the thumbnail for topside detail view of the plastic divider’s fastener. SEE “Encyclopedic Fastener Chart” to research mounting device terms.